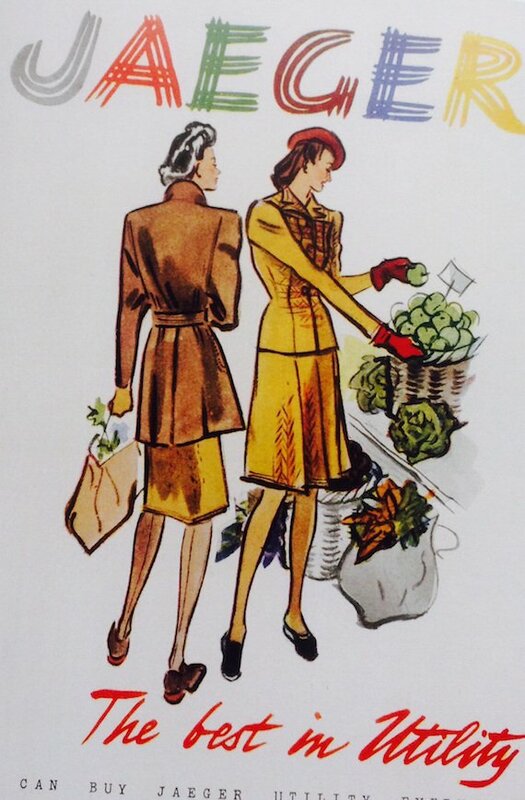 1940s fashion in Britain was, of course, hugely influenced by the Second World War, which broke out in August 1939 and lasted until 1945, though clothes rationing wasn’t completely over until the 1950s with clothes rationing ending in 1954. In some ways – lots of ways – the changes that women were forced to make to their ways of dressing were hard, but in others there was a freedom and a creativity that they hadn’t seen before. Hats, gloves, and even stockings weren’t compulsory any more, and the restrictions on fabric permanently changed the way that womens clothes were made and decorated, leading to much simpler and more streamlined fashions. For some sections of society, the war didn’t change anything. Some very rich people missed their twice-yearly trips to Paris to buy couture, and other rich people might have missed checking out what was fashionable in Paris and having their dressmakers make copies of it, but their wardrobes would have been so well stocked that they would not have run out of clothes and rationing may not have affected them at all. 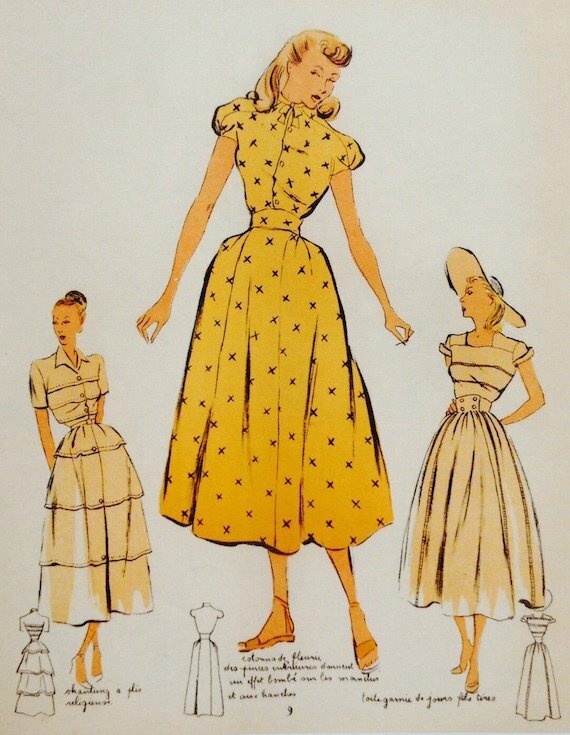 If they wanted to ring the changes and keep up with 1940s fashions, they had their dressmaker alter existing garments. Similarly, very poor people were, obviously, hugely un-bothered that there were no new styles coming out of Paris, and rationing didn’t affect them in that they simply couldn’t afford new clothes anyway. 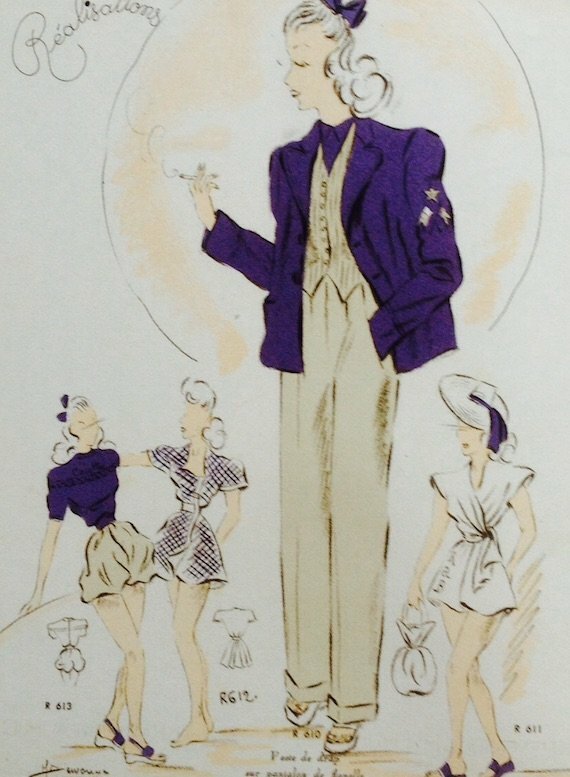 Masculine tailoring and beach outfits for parisian cooture, 1947. 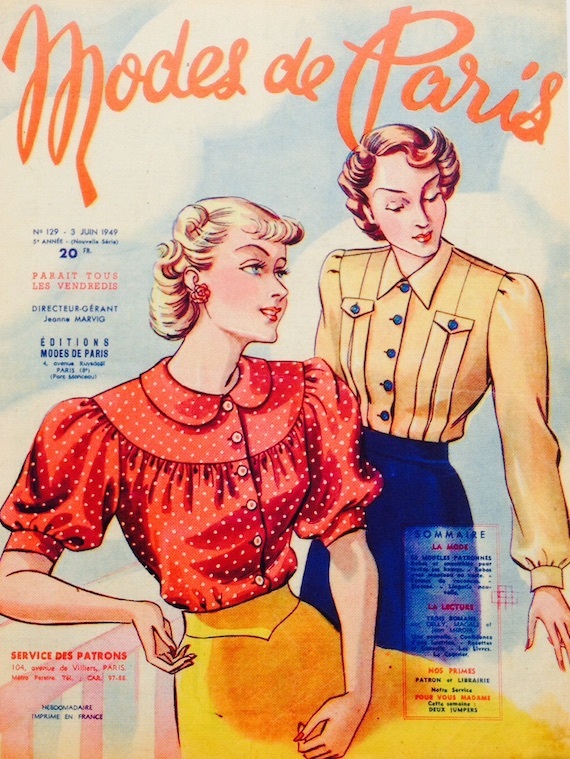 A controversial fact – the wheel of Parisian 1940s fashion did continue to turn in the Second World War. While France was under German occupation, the President of the Chambre Syndicale de la Haute Couture, Lucien Lelong, fought with the Nazis to keep the fashion industry alive, in order, he said, to keep jobs and prevent those involved from being sent into potentially dangerous war work for the Germans. 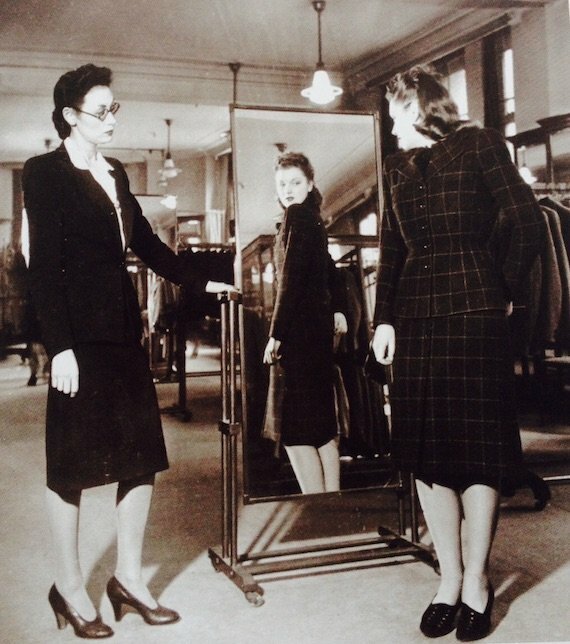 Many 1940s fashion houses did close, in what couturiers hoped would be for the duration of the war but they were forced to re-open under threat of the businesses being treated as abandoned and taken possession of by the German state. 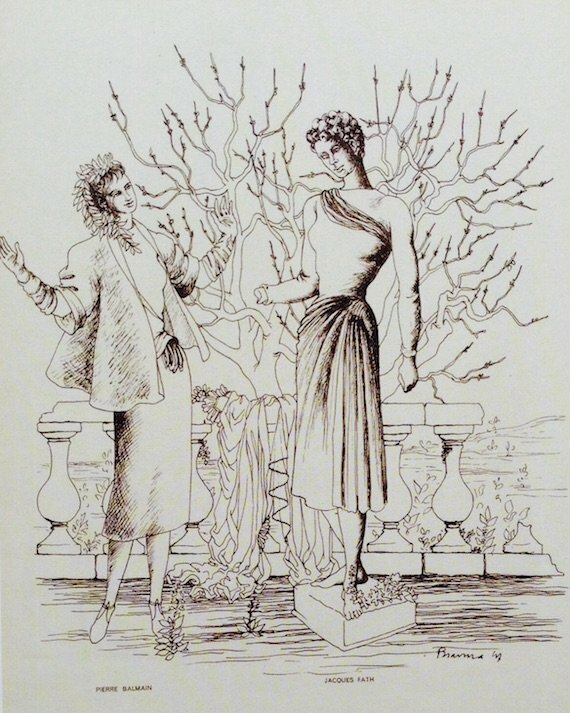 Only customers from neutral countries, those who sided with Germany, or of course, Germans could shop the Parisian 1940s fashions or even visit France, so naturally British couture customers had no idea what was going on. 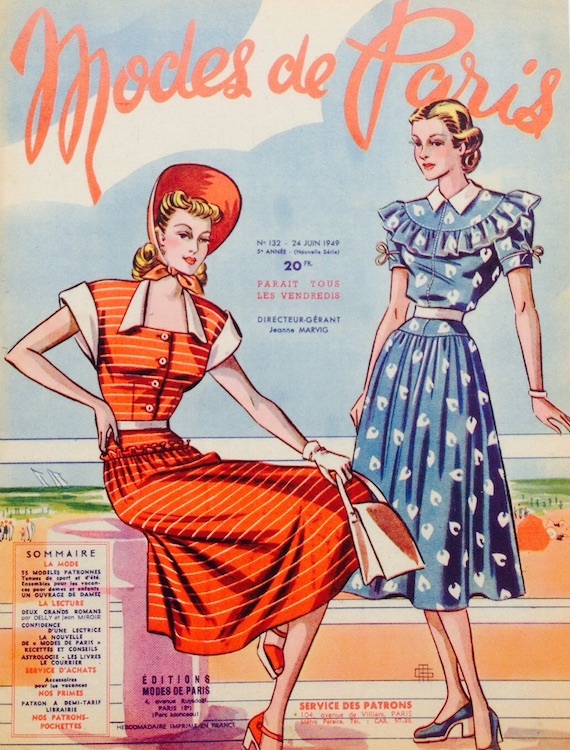 Full skirted French fashions, 1948. 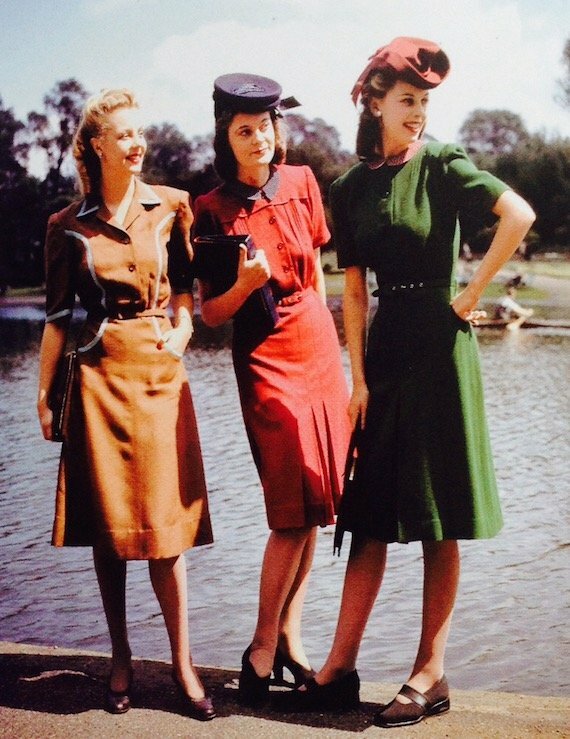 The French day dresses in the New Look style, 1948. 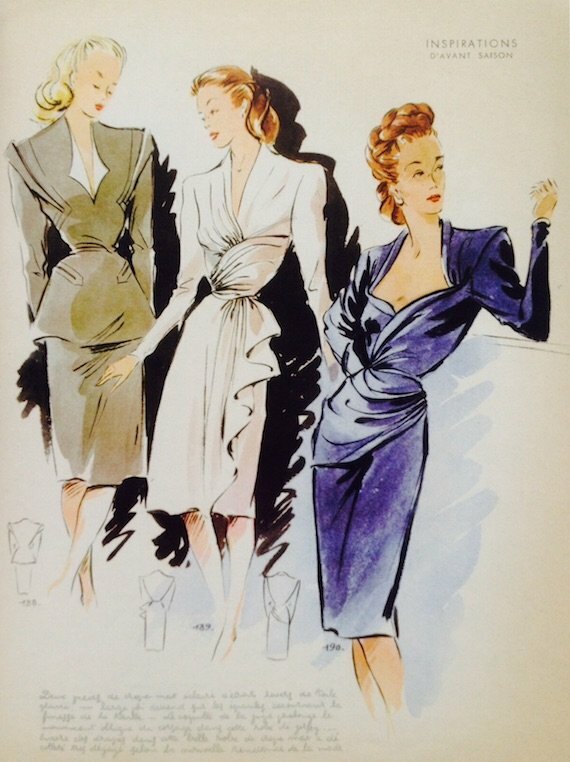 Paris couture continued to produce their twice yearly 1940s fashion collections. The controversial part was the idea of these couturiers dressing the enemy: bending to a Nazi officer’s wife with a mouthful of pins and declaring she looked glorious in her Parisian silks while French women were now in rags. Or, perhaps worse, they were dressing those French who collaborated with the enemy – some called Lucien Lelong himself a collaborator. And of course, putting great resources into such frivolousness was considered inconceivable, especially in nations like England who had narrowed down its production as far as possible to food and bombs. 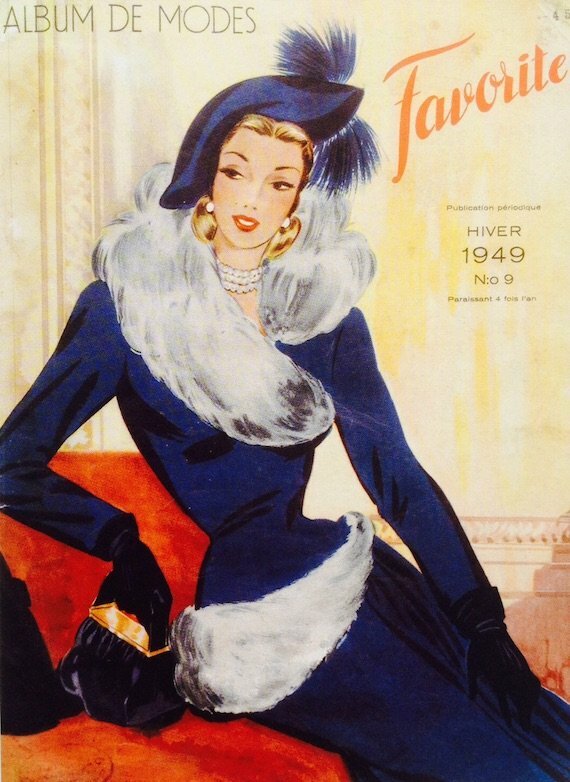 Furs for the French woman in 1949. Some designers outwardly complied with the German’s rules yet at the same time stuck up two fingers to them – Madame Gres was repeatedly in trouble with the German authorities for doing things like designing 1940s fashion collections in red, white and blue, the colours of the French flag. Others stepped out of the fray altogether, but couldn’t be considered patriotic – Coco Chanel never dressed German officer’s wives, but spent the whole war holed up in the Ritz with her lover – a German officer. French women had a different war-time attitude altogether to war and clothes. Whilst British women were encouraged to be patriotic by foregoing fashion and making great sacrifices in clothing, French women showed their patriotism by defying their victors and wearing the most extreme fashions possible, with huge and tall hats, impractical high heels and extravagant amounts of fabric used on dresses. When Parisian fashion went back to its usual footing in 1945 after the liberation of France, couturiers presented these decadent pieces in their collections but they were rejected by the fashion press since most of the rest of the world was still under austerity. The 1947 “Corolla” collection of Christian Dior, dubbed “The New Look” which had a very full skirt, though retrospectively noted for its free use of fabric, was actually a toned down fashion compared with what Paris had proposed in 1945. How Hitler wanted women to dress. 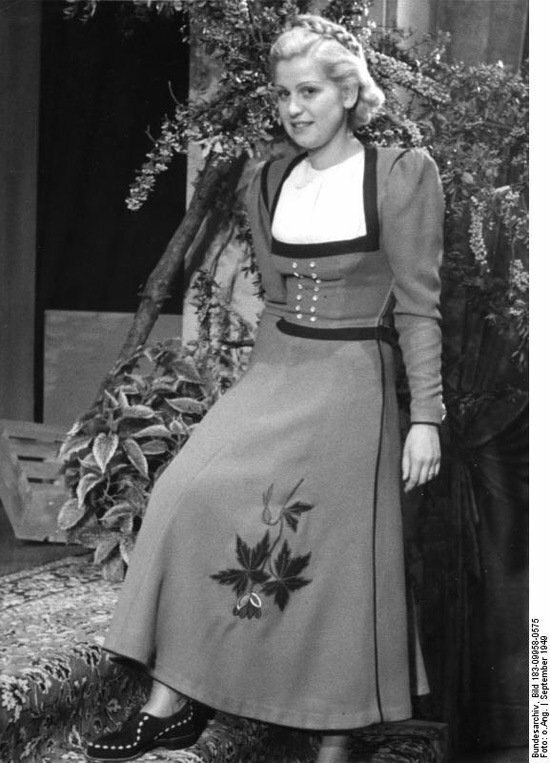 German women, meanwhile, were encouraged to be patriotic by renouncing fashion in the 1940s (considered to be a Jewish business) altogether and dressing in traditional German dirndl skirts and folk embroidery, with long, un-dyed hair and no makeup. They should not try to be slim as dieting damaged their chances of motherhood, which was supposed to be every German woman’s goal, alongside being the perfect wife. In fact, glamorous peroxide blond curls continued to be the favourite hairstyle of the German women, alongside red lipstick, a look which even Eva Braun, Hitler’s long time girlfriend, sported. 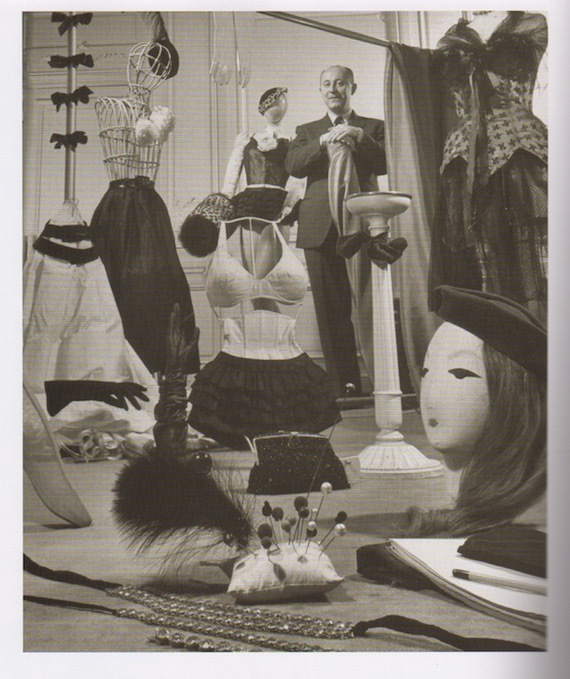 It is also slightly at odds with Hitler’s wish to move the Paris fashion industry to Berlin and Vienna to become the new worldwide centres of fashion, a move Lucien Lelong resisted, pointing out that it was generations of Parisian skills and training that made Paris the centre of Haute Couture, and that couldn’t be moved lock stock and barrel. By the end of the 1930s, fashion for British women consisted of a wardrobe built around knee-length dresses, skirts and blouses, which were colourful and decorated with not only with fabric prints but lots of flounces and surface decoration. The outfits were topped by jackets, boleros and cardigans and jumpers for casual wear. They were underpinned by foundation wear like girdles to give a flat stomach and bras to give an uplifted, quite pointed bust and finished with gloves, stockings, hats and kitten heeled court shoes. The silhouette was triangular, with an emphasis on the shoulders, a nipped in waist and a noticeable pointy-ish bosom. 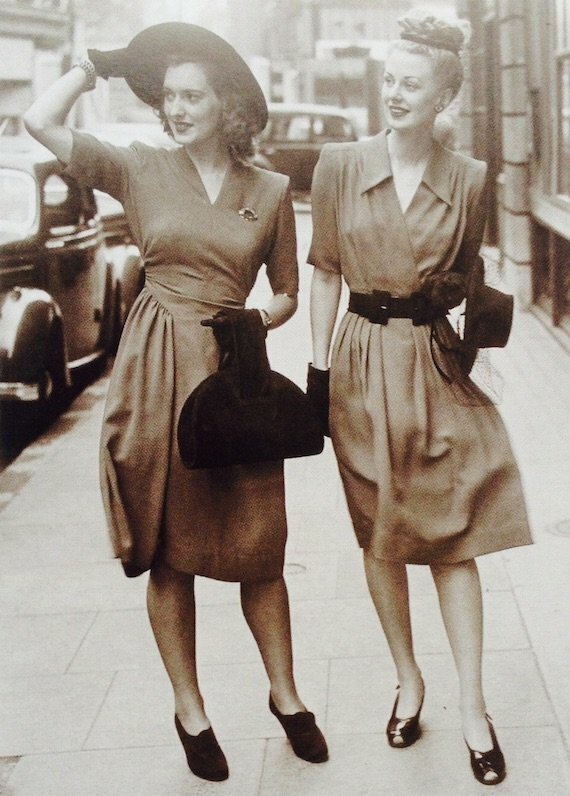 Two British Utility dresses of 1946. There is more fabric in the skirt than before. photo by William Vanderson, 1946. 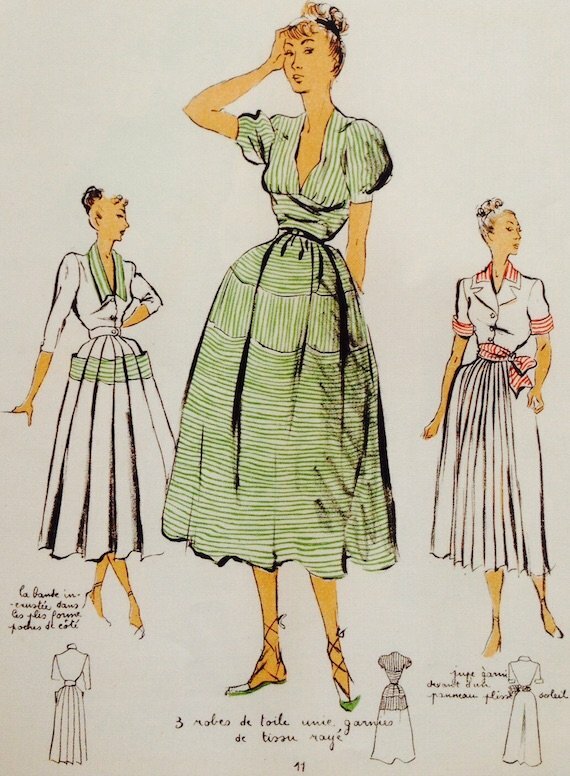 Coming into 1940s fashion, by the end of the war dresses and skirts stayed but extras were stripped away, and gradually gloves and hats became unavailable or too expensive, girdles were not very effective because of how they were made, and finally even stockings were no longer considered an essential, every day item. Clothes were still colourful but prints became smaller as they were easier to match, and there was far less extra decoration like ruffles, appliqués or embroidery. 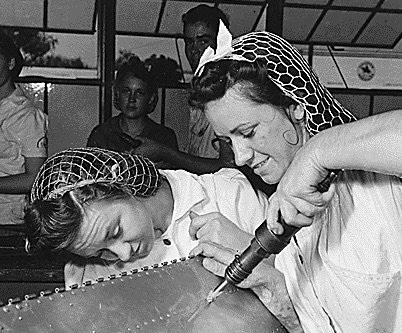 factory workers wearing crocheted hairnets. When the war first broke out in 1939 most English fashion houses closed down. They entirely abandoned their carefully worked on autumn shows because most of their London clients had left for the country anyway. 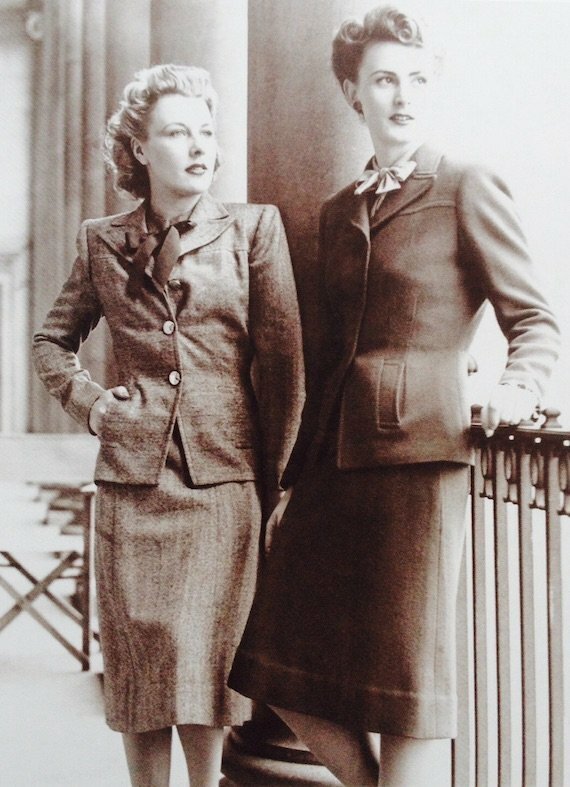 After the war concluded in 1945 Britain was still under austerity and fashion continued with styles very similar to war-time ones, and it was not until very about 1948 that enough fabric and money was available for anything approaching Dior’s New Look. 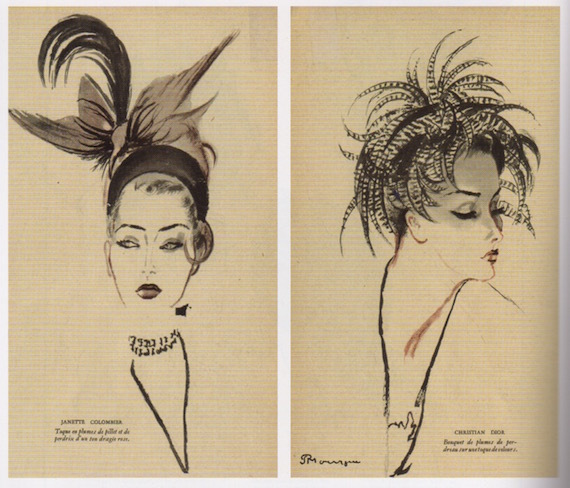 Pages from Vogue, June 1941. Fashion magazines continue to be published throughout the war, even when magazine offices were bombed. Magazines such as Vogue saw their job as keeping British women’s morale up, and giving practical advice, as well as presenting fantasy creations which helped them to dream about what life would be like when the war was over and things returns returned to normal. The government saw magazines as a crucial method of disseminating information to women. They worked with Vogue and other titles on subjects like making practical short hair seem glamorous and on keeping women cheerful during shortages, as well as presenting make do and mend as a chic option. A choice of demob suits. Clothes rationing began in June 1941, two years after food had first begun to be rationed, and it came as quite a surprise to the British who had not been forewarned of it. Something that people today get slightly confused about is rationing and money. Ration booklets did NOT replace money. They were in addition to it. Each British person got a certain amount of ration coupons each, and each item of clothing cost a certain number of coupons each, PLUS its cost in pounds, shillings and pence. So a winter coat was, for example, four coupons plus £1.00, and baby’s vests were half a coupon plus a few pence. 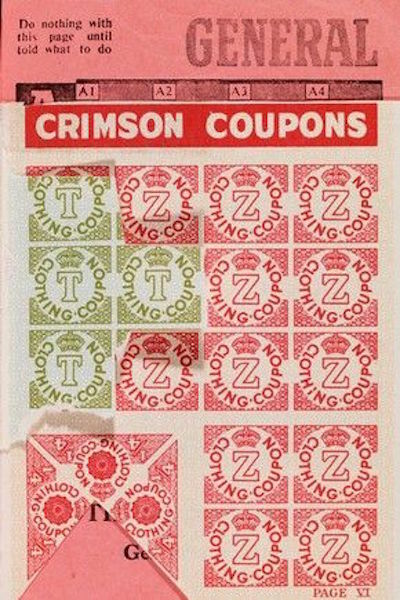 Although each person got a book of clothing coupons each year, consisting of green coupons they could use now and red coupons they had to hold on to for a few months time, the value of coupons changed according to what there was a shortage of at the time, so rarer items began to cost more coupons as the war went on. The war office made continual updates, and the system could be very confusing. But even if you were prepared to spend your coupons on an item, it didn’t mean that it would necessarily be in the shops, and even if it were in the shops, you might not be able to afford it. Inflation on clothes almost doubled in the war years, and luxury items like furs were highly taxed. Shopping for clothes meant juggling coupons, money and availability. There was a black market in coupons, with early coupons being easily forged (the design was quickly improved), and many coupon books being reported “lost” that were replaced, no questions asked – later claims needed a fee to be paid along with an official stamp for replacement. Poorer people who could not use all their coupons as they couldn’t afford to buy clothes often sold them for money or food, as did older people who seldom left the house and didn’t need to renew their wardrobes. Clothes ration coupons were separate from food ration coupons, although at one point when the coupons themselves ran out it was announced that people could use their margarine ration coupons instead, which reportedly led to even more confusion as women turned up at 1940s fashion shops wielding packets of actual margarine to swap for hats. The reasons for the shortages were partly imports that stopped during the war – all of Britain’s rubber came from Japan, so when they ceased sending it there were no more Wellington boots or material for shoe soles. Clothing factories and their workers had been turned over into making uniforms instead of civilian clothes. There was also material that was made in Britain yet was now needed for war supplies – wool for uniforms and not winter coats, silk for parachutes and not stockings. Perhaps most surprisingly, this last was not entirely true though. We did need a lot of wool for uniforms but since the Board of Trade had bought the entire wool output of New Zealand, Australia and most of South Africa we had quite a lot of wool, and plenty of silk too. The extra wool and silk were earmarked for export, to keep the economy afloat. “Utility clothing” doesn’t sound so attractive, and the British population of world war two didn’t think so either. Producing or wearing utility clothing was not compulsory, but manufacturers who made it were offered greater supplies and certain exemption of their workforce from war work if they agreed to it, and the finished product was cheaper in the shops. 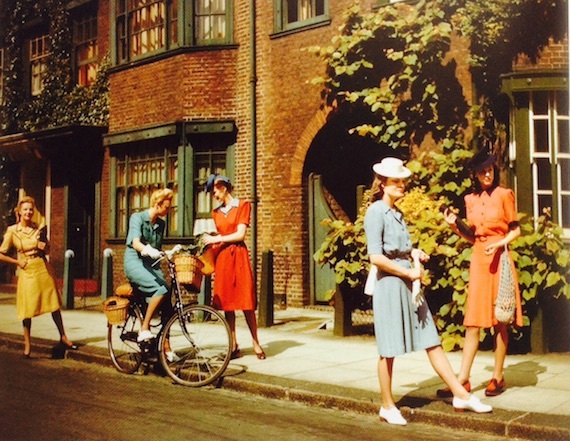 In fact, utility clothing was not some drab, grey uniform but dresses just as colourful as the usual 1940s fashion, and sometimes better quality. The general idea was to save fabric, and this was done by removing extra details like pocket flaps and ruffles, and making skirts a little shorter and tighter. The printed patterns that women enjoyed were still there, but the scale became smaller to facilitate matching. Utility clothing was introduced across all items of 1940s clothing, including dresses, coats and undergarments, children and baby’s clothes and menswear. A model tries on a Utility suit, date unknown. Photo by James Jarche. The government was concerned that the end result was good quality, and in some cases where people had been used to dressing in second-hand clothing or in hand-me-downs a little girl’s utility dress was the nicest thing she had ever owned. But still, the public was not convinced, and so the board of trade did two things – one was to introduce a snappy logo, the CC41, which quickly became known as known as the two cheeses for obvious reasons (in fact there were two logos, the second for “posh” utility clothing, but the two cheeses were the most commonly seen). The other was to invite a select group of high fashion designers to set their minds to producing collections of utility clothing. The designers, who together formed a group called InSoc (Incorporated Society of London Fashion Designers) were given special permission to leave their army posts, if they were in service, to oversee the completion of their InSoc collections. 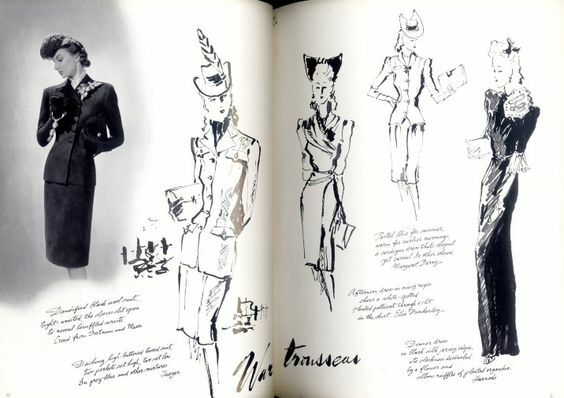 Norman Hartnell, Hardy Amies, Digby Morton, Edward Molyneux, and Bianca Mosca’s designs were a great success, and many manufacturers ordered their patterns to produce in their own factories. 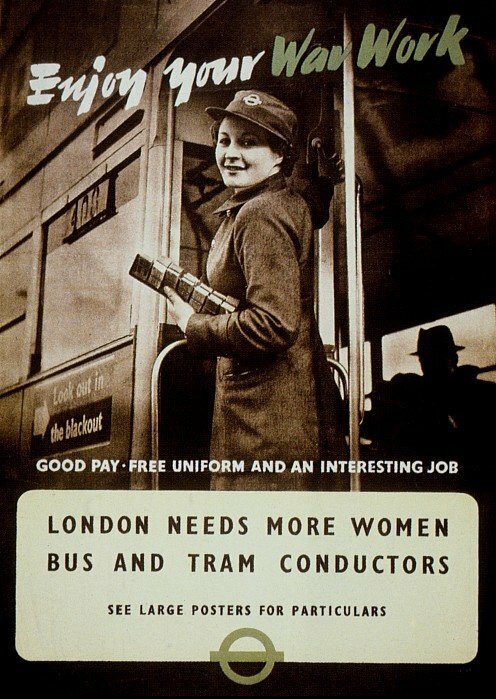 Advert for female tram conductors. The idea of a national uniform for civilians had been proposed early in the war to instil a sense of unity and national pride. It was decided that this would not sit well with the rebellious British, and looking at the efforts women made to individualise their factory uniforms, this decision was probably wise. 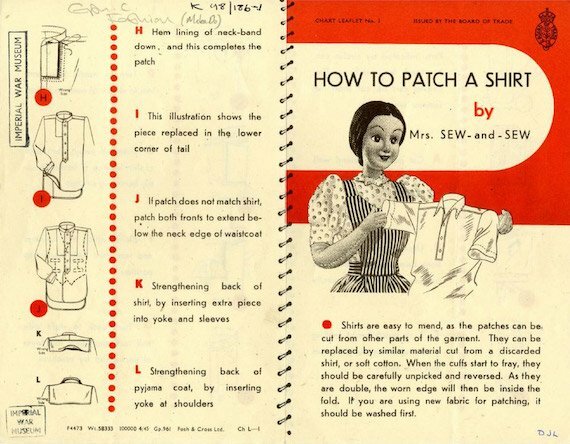 In 1940s Britain, the vast majority of women could knit and sew, and knew how to make their own clothes. So when clothing became scarce on shop rails, they naturally turned to making their own from the cloth that was still for sale, or in some cases that they had stock piled. Many women were also very good at re-making existing clothes, adding a new collar or changing the line of a coat to update it, or if they didn’t already know how they revelled in the challenge. The Women’s Institute began running “Thrift Classes” in 1940, and local authorities also ran clubs on dress making and renovations. 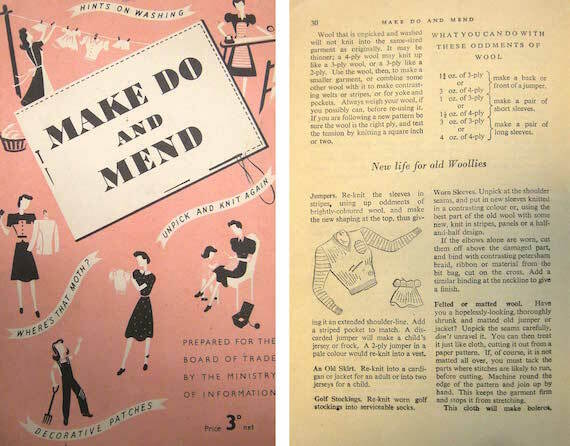 By the time the government’s official “Make Do and Mend” campaign came along in 1943, many women grumbled that they had been doing just that for several years already. The campaign was fronted by an ever-cheery doll called Mrs Sew-and-Sew, who gave tips on making clothes last longer by careful cleaning and airing, and how to dry shoes so they didn’t crack. They were certainly good ideas, but with many women now working or volunteering on top of their normal work in the house, added to their burdens. However, it now became more acceptable, patriotic even, to appear in public in darned or made-over clothes, so much so that it was almost embarrassing to admit that you had a new skirt, and better to boast about how it was some old thing you’d simply freshened up if anyone admired it. Although some richer women missed getting dressed up, and felt sad that with their husbands away and many social events like grand balls cancelled, to be replaced with slightly less elegant social affairs like sewing groups, there was no need to dress up any more and no-one to dress up for, some welcomed the relaxation of social codes that meant the regular changes of clothing in the 1940s for day, dinner, evening, etc were no longer necessary, and even for lower class women the high standards of propriety were relaxed so women now went hatless where they wouldn’t have dreamed of before. In some cases all social classes worked together in sewing groups or in war-time jobs and this promoted a new understanding between the classes and sense of camaraderie between women that perhaps wasn’t here before. Some women also really enjoyed the chance to be creative with their clothes and to be valued for being clever with their hands. Children soon grow out of their clothes. People tried to make their own clothes last as long as possible, but especially with children’s clothes the second-hand market was bustling. Second hand clothing was not rationed, but prices for that, too, inflated so wildly that eventually, in August 1941, the government fixed the price of second-hand items. Second hand clothing exchanges were organised all around the country and clothing banks were set up by charities to donate supplies of second-hand clothing to the most needy for free. 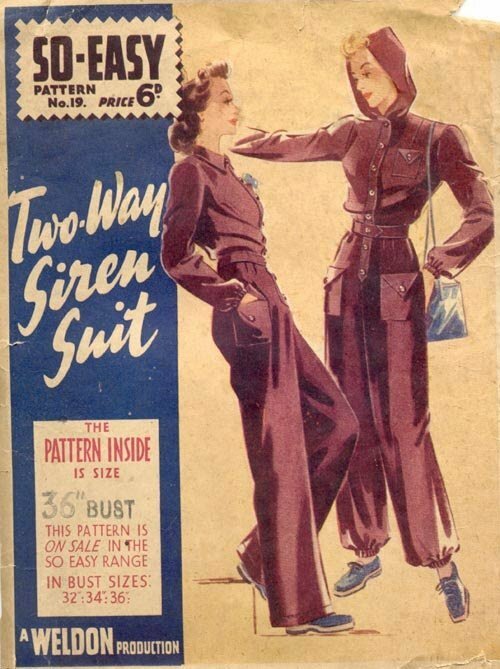 A pattern for siren suits. Trousers had been in and out of fashion for a while by the time 1940s fashion swung around, but were generally thought of as daring, racy or peculiar, not suitable for the middle-aged housewives of Britain. Trousers were provided as part of some uniforms and women quickly recognised how practical they were when scrambling into air raid shelters or doing war work – especially as stockings were so hard to come by – but there were many disdainful comments. “Fascinated by their new competent appearance or by their long slim legs, women kept their trousers on in off-duty hours. 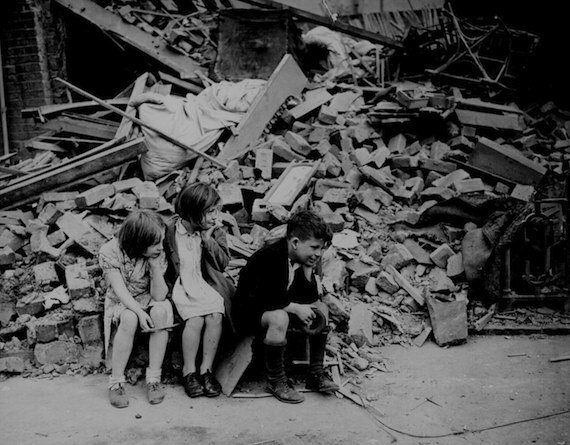 Now you see trousered women in West End restaurants, 16 stone women in flannel bags, young mothers dandling their babes in most un-maternal corduroys; and similar incongruous sights” sniffed journalist Anne Scott-James in 1940. 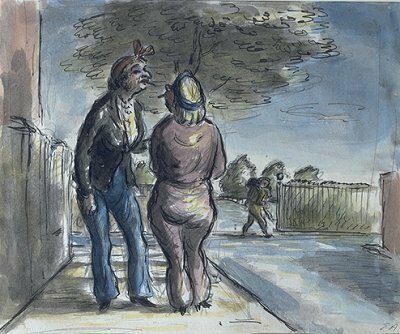 If Only They Knew What They Looked Like by Edward Ardizzone, 1941. Still, all in one “Siren Suits”, a long-sleeved, hooded jumpsuit, were gladly worn in case the siren sounded. They were mainly for females, but Prime Minister Churchill had two. Not a national uniform. This is actually Princess Elizabeth training to become a mechanic.It shows how individual British women’s wardrobes were. Many women of the Second World War had seen their mothers climb into uniforms and work to support their country in the First World War, before being replaced by men returning from the front line and dissuaded from working outside of the home. Now it would be their turn. 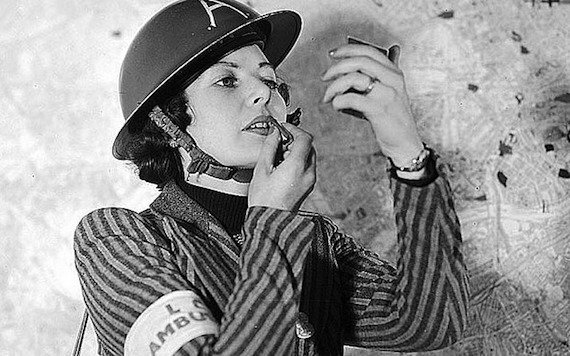 Conscription was put in place for women for the first time in British history in 1941, with single women between the ages of twenty and thirty required to serve. The age range was later extended to include women between the ages of 19- 43, and First World War veterans up to the age of 50. They could choose whether they joined the armed services, or worked in civil defence, the land army or in industry in jobs not previously open to them. Other women freely chose to join them. Women in WW2 worked as transport conductresses, in offices, and in factories. In a paragraph that sounds almost unbelievable to modern ears, Louis Katin describes just how strange it was to see his wife, Zelma Katin, working as a tram conductor in 1939. “It is remarkable because up till now you’ve only seen her at work in the home; and when you have been on the same bus together, it’s been simply As fellow passengers… But now, all at once, something big has happened. It’s also the policeman slowly treading the pavement in front of who has suddenly bent down and rolled his trousers up to his knees and started to do a ballet dance in the middle of the street”. Zelma was given a uniform of trousers for winter and a skirt in summer, jacket and overcoat all tailored to her figure. Land girls were also given their own uniform consisting of Wellington’s if they were very lucky, before rubber ran out, or sturdy boots, a warm jumper, blouse and breeches or overalls. Women serving were also given uniforms. Some women were absolutely delighted with these, since they were brand new and, as one woman remembered, [it was amazing] “to have a pair of shoes that had never been worn before. They were as hard as hell and I was crippled for weeks but it didn’t matter. I was so proud. Nobody else’s foot had ever been in these shoes before me.”Not only were the shoes hard, but many of the uniforms were not tailored to a woman’s figure, with exactly the same design for male and female alike. There are stories of women steaming their wooden uniform jackets, and shaping them over their knees to create bosom room. Some were luckier. 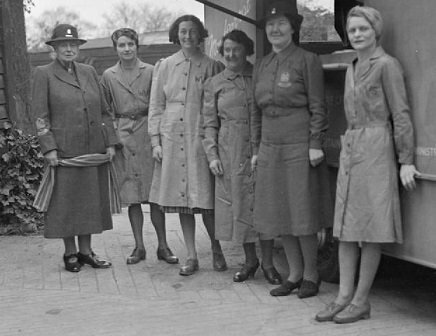 Volunteers for the Women’s Voluntary Service (WVS) were given uniforms designed by London couturier Digby Morton. Harrods made and supplied it. Christian Dior shows some of the underwear needed for his new creations, 1947. If you told us, in 2016, that we’d have to do without tights I think we’d be mildly annoyed but not devastated. But in an era where it was weird to wear trousers, where dresses and skirts were knee-length, where no woman went bare-legged unless they were on the beach and sometimes not even then, it’s not hard to imagine what a blow the rationing of stockings (no tights in 1940s fashion) was. Going without would feel like going out half-dressed. Silk stocking disappeared from shops very early on in the war, and poorly made nylon utility stockings replaced them. These were bad enough, bagging badly at knees and ankles, and stiff and badly fitting everywhere else, but eventually they became hard to find too. The stories of women painting their legs with gravy and drawing on the seam with eye pencil are true, but probably rare, and cosmetic companies also made a “stocking cream” which did much the same job, a kind of paint on tan to which you added a drawn-on seam, but it was very expensive for daily application. Shops promising to re-foot or invisibly mend stockings did a good trade. Eventually in 1942 there was a proclamation from the archbishop of Canterbury which stated it was acceptable to go to church bare-legged, and hatless too. Some forward-looking government offices did the same. But most Church going women, even if they were forced to go bare-legged to work, did their very best to at least get one pair together for Church on Sundays despite the edict. British lady trussed up in her underwear, 1940. The girdle has a tiny pocket. Apart from stockings, women wore girdles, which were now made without steel or rubber. Some complained that the new ones were literally made out of cardboard which collapsed very quickly. Younger, smaller and more daring women sometimes decided to go without and wear all in one camisoles instead, which were a revelation for some who said it felt as if they were wearing nothing at all. 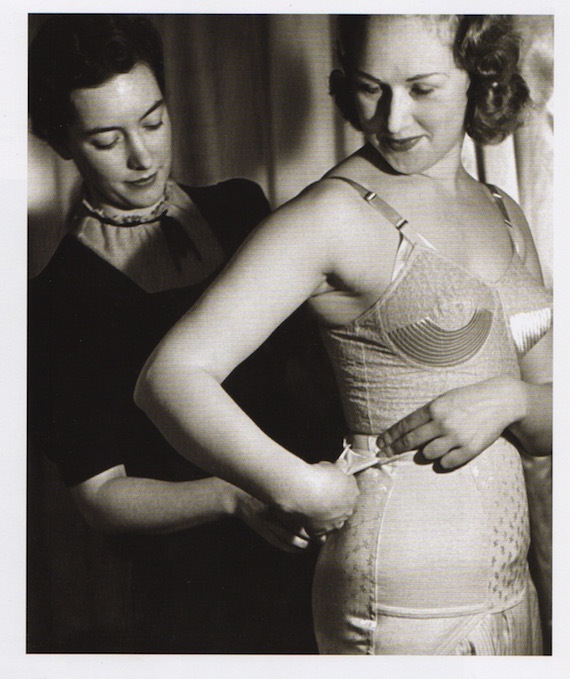 Knickers and bras could be made at home if you could get the fabric, especially as bras were much less complicated than they are today, coming in only four sizes corresponding to small, medium, large and extra-large. Both of these items were usually made without elastic which was largely unavailable, just tiny buttons instead. Some women resorted to taking the elastic out of one par of knickers before washing them, and painstakingly re-threading them into their clean pair before putting them on. Parachute silk was used for underwear and christening and party dresses, stripped from downed German pilots or from parachute factories when fabric was damaged during construction. But it was quite stiff and very slippery. Architect’s discarded blue prints, if you happened to know an architect, could be boiled to release the muslin within and used too. 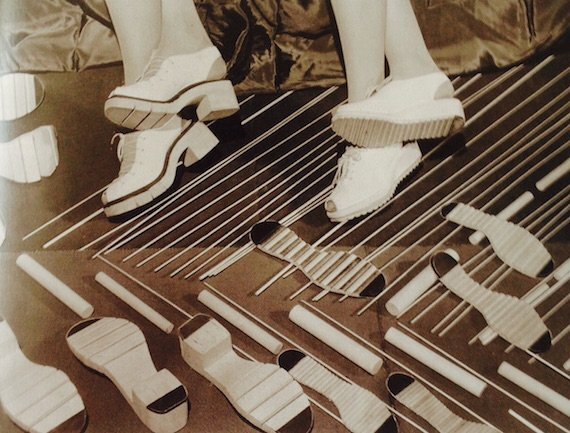 Stages of manufacturing wooden soled shoes, 1943. Shoes in 1940s Womens fashion were an ugly affair. Experience had convinced women that rushing to the nearest air raid shelter in high heels was no fun, and delicate shoes didn’t stand up to long walks in the rain when no taxi appeared to take you home. Very practical, low heeled shoes were needed. There was less leather than before, so smaller pieces were seamed together to avoid wastage. To make matters worse there was no rubber for soles, and these began to be made of wood, hinged where the foot bends. Apparently they were noisy and heavy. Cork soled platform wedges were made for glamour girls – but compared with the delicate heels of the 1930s, even these were clumpy. 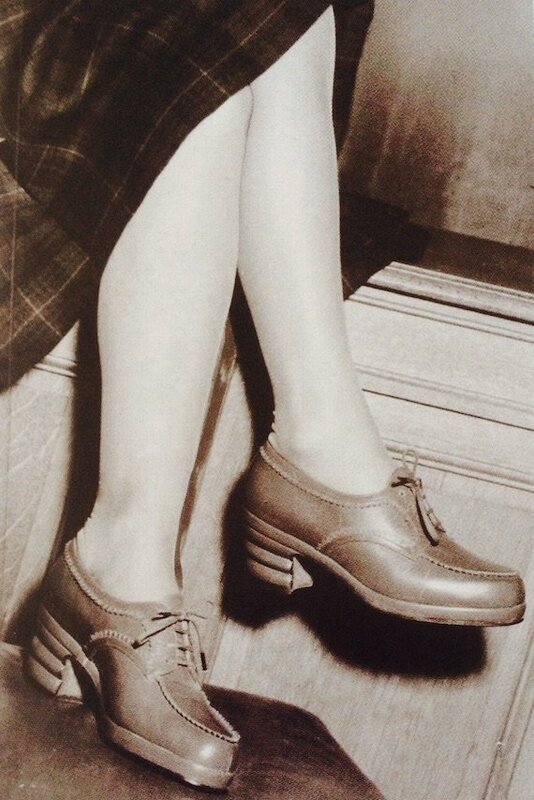 Practical brown leather Oxford shoes, 1945. Hats were a luxury item in 1940s fashion and therefore not subject to rationing, but they were taxed and suffered greatly from inflation. They, like most luxuries, had doubled in price and so women refurbished their old ones or more and more often, and would rather go without than wear a shabby old one. Turbans, sometimes pre-made but also made of all sorts of fabric including dusters if they happened to go with the outfit, were popular because they covered hair that was none too clean with the shortage of shampoo, and kept it out-of-the-way when they were working. 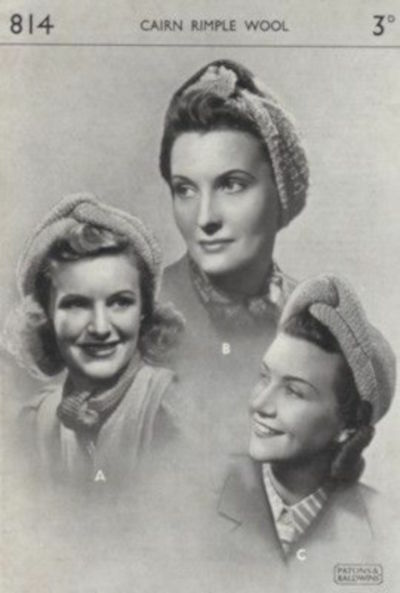 Knitted and crocheted hair nets were supposed to be practical but in a factory setting were very flimsy – there were stories of girls getting their hair caught in machines with horrible consequences despite wearing them. 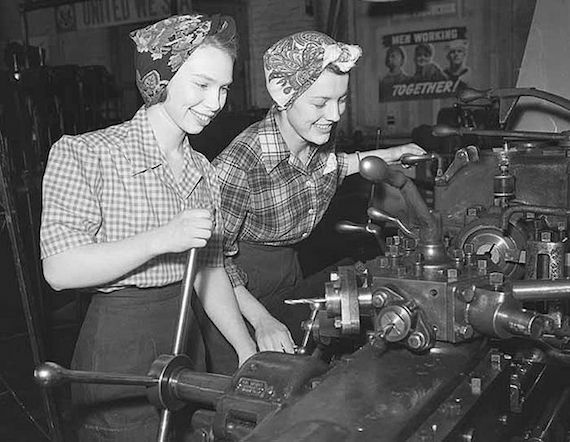 In response to these accidents, safety inspectors insisted that women wear the hated peaked caps that were part of their work outfits, with their hair tucked underneath. Large, roomy bags became more practical, and were sometimes knitted or crocheted, though of course a lot of women simply kept using the handbags they already had. Gas masks had been handed out, and though thankfully they were never needed as gas attacks did not happen in Britain they were supposed to be carried around everywhere – there were fines if you were caught without on. It came with a canvas bag with a thin strap, but some more glamorous people bought specially made, more elegant bags from companies like Turnbull & Asser. 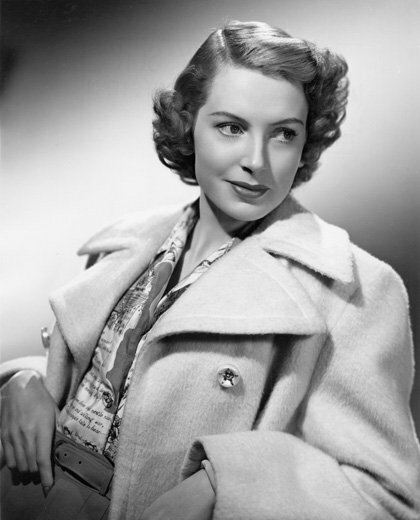 Deborah Kerr, ravishing with shorter hair. Service women were not allowed to wear hair longer than collar length, and magazines suggested various practical styles, curled around the ends and held off the face, that would work well with uniform caps. They ran features on film stars like Deborah Kerr who looked ravishing with shorter hair, and their attempts at persuading the nation that short hair was better were very effective. With the lack of hot water and shampoo, short hair was easier to manage anyway. Veronica Lake 1945. Scanned by jane. Enjoy! 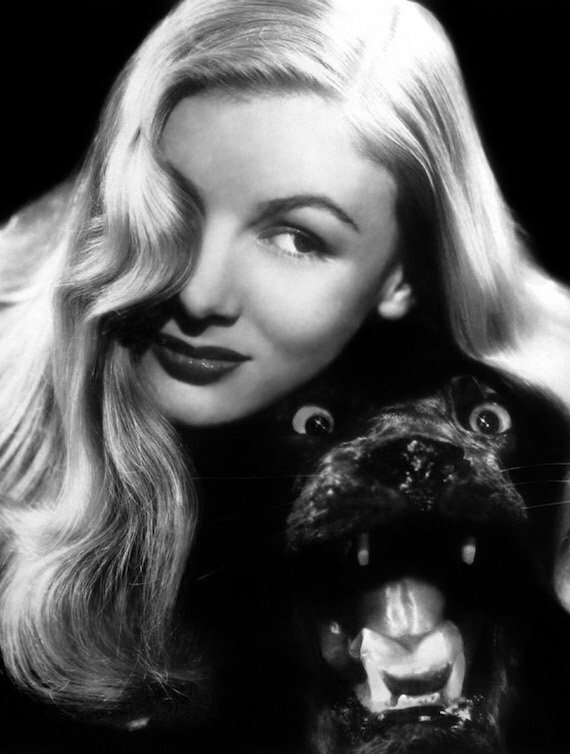 Veronica Lake, the screen star, had a much copied “peekaboo” hairstyle, with a flick of her long hair poised seductively in front of one eye. Of course the poor girls copying it couldn’t see too well, so the Hollywood star was asked to change her hairstyle. This she did, sweeping it off her face in what became known as the Victory Roll. An ambulance driver attends to her makeup. Although women were urged it was their duty to look beautiful and stay lovely, chemical companies had been mainly given over to bomb production and cosmetics soon dwindled. Lipstick supplies were one of the last to go and women hoarded their lipsticks, applying lightly to make it last. Tips for natural concoctions were passed around, from simple ideas like staining the lips with beetroot or berries to more complicated home-made face creams. 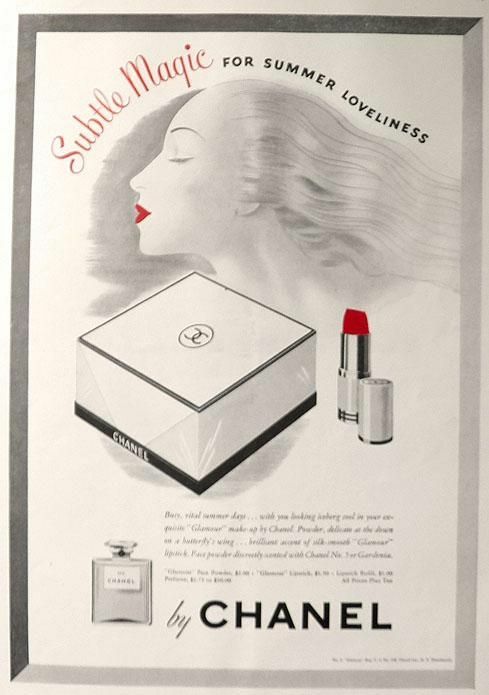 Many cosmetic companies continued to run adverts in 1940s fashion magazines, confessing that they had no supplies just yet but urging customers to stay loyal. Companies who did have ingredients tried to diversify, promoting creams for factory worker’s complexions or protective hand creams. Some war workers, such as those making bombs or weaving baskets, which was especially hard on the hands, were allowed protective face or hand cream off ration. 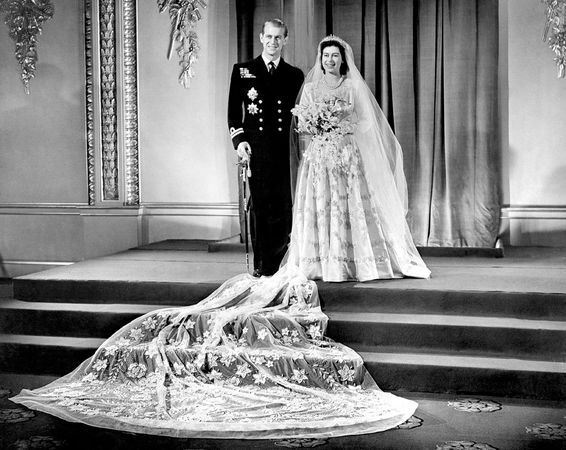 Princess Elizabeth gets married, 1947. Wedding dresses, the sort we think of now, white, frothy and worn only once for the big day were a huge luxury in the first half of the century, and many women even before the war preferred to buy or make a new dress that could be worn on other occasions, or if they couldn’t afford a new one to wear their best dress with a new hat, perhaps. This was continued during the war. Although many rich women wore white froth (including the current Queen, then Princess Elizabeth, who propaganda said saved her coupons and pennies just like anyone else to get her massive embroidered gown, which was made by Norman Hartnell in 1947) many decided on a simple suit, and wore it again and again afterwards – not necessarily for work but for other people’s weddings and other smart occasions. Some did wear a dress, not always white but defiant scarlet, and some made a version of the traditional gown in parachute silk or even upholstery fabric (which was not rationed at the beginning of the war). Service people were supposed to wear their uniforms. As we’ve seen, these were not the stuff of many women’s dreams. Barbara Cartland, the romantic novelist, certainly didn’t think so. She spent what would be about £500 today of her own money in buying two second-hand wedding dresses. These she took to the Chief Controller of Women’s Forces, asking the War Office to provide the money for a whole collection of wedding dresses in different sizes. They agreed, and Barbara travelled up and down the country purchasing second-hand bridal gowns, to be borrowed by service women for their big day, cleaned and returned for the next bride. She succeeded in giving many women the day they’d always dreamed of in a time where there was not much to look forward to at all. Clothing austerity for men ended in 1944. There had been fierce resentment at some aspects of utility clothing for men – including the loss of their trouser turn ups, and the shortening of the knee-socks they were used to into 9 inch socks, more like the length we often see today. There were other fabric saving modifications too, but these were the ones that really seemed to make men see red. The government didn’t want their returning heroes to come back to England and face the ignominy of short socks, so normal male clothing was re-instated. 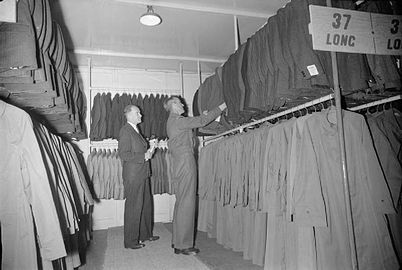 In addition, service men received the wonderful gift of a full suit of ready-made clothes worth about £480 in today’s money and three times as many clothing coupons as his civilian counterpart. Service women on their return had no such welcome, although they did receive equivalent cash and clothing coupons. The problem was, with clothing still scarce in the shops, many found it quite hard to actually the clothes they wanted. Utility clothing for women only ended in 1949, and it took several years for manufacturing and supplies to get back to normal in Britain. 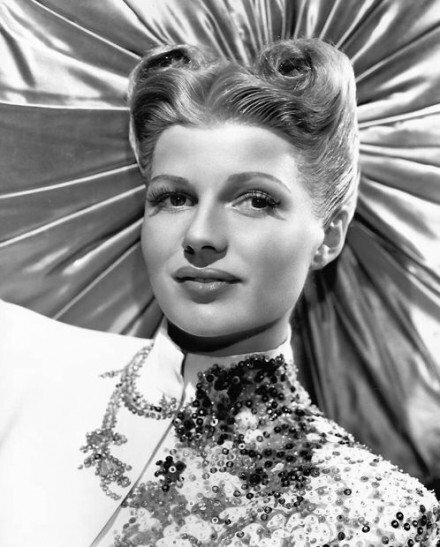 Even when they did, social mores around 1940s fashion clothing had changed forever, as women had learned through necessity that to go hatless, glove-less, with minimal support underwear and barelegged was OK in 1940s fashion – the modern woman was born.